This article is re-printed from Medium because we feel it will be of interest to readers of CJ and we believe it deserves a wider audience. Ben Johnson at Gruvi kindly agreed for us to re-publish it here. This article is Part 3 in a series of 3. If you would like to read the first two articles, which provide the background before looking ahead, you will find them here and here. While researching our previous articles, it became clear that the process of creating, distributing and exhibiting content is under immense pressure from changes in the industry created by advances in technology like the internet. While some parts of the industry are resisting change, others areas are growing and flourishing. We wanted to share our perspective on what we feel will occur in the entertainment industry over the next ten years. The cost of going to the cinema has remained largely price inelastic with “cost per ticket growing at twice the rate of net revenue”. With the growth of home entertainment offerings such as Netflix, the habit of movie going will come under increasing pressure. We predict a continued incremental decline in the established markets of Europe and the USA that will lead to cinemas adopting variable pricing models. This could be decided on the basis of the film’s budget, length and scope of a film’s theatrical run, down to the seating quality and time of day. In the not so distant future we envisage that each established market will be represented by a local KYAK or Momondo and we predict that this power play will come from services like Fandango, etc. Smaller venues will have to get creative. Those who will survive will do so through government subsidies (such as the Europa Cinemas initiative of the European Commission) or through active support from the communities they service. This all revolves around the idea of ‘event screenings’ that some movies will also experience more with in order to create a buzz. 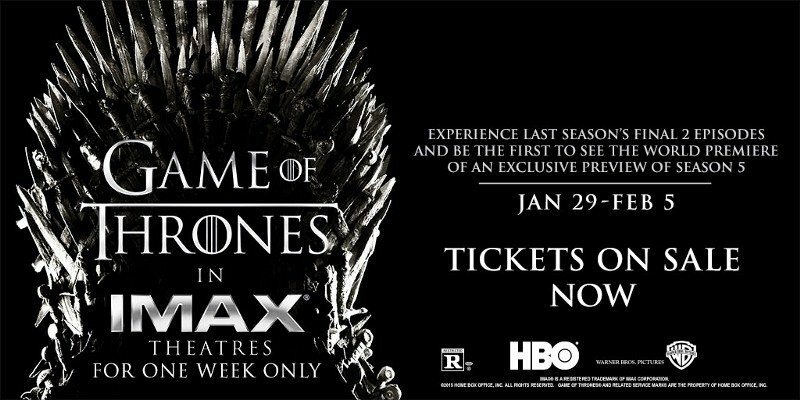 As a ‘limited edition’ event, the premiere or finale of a show justifies charging a premium price to be viewed as a cinema experience. It’s a strategy that can profit TV networks, the venues (theatres), as well as technology companies (such as IMAX or Dolby) which will be continuously seeking to enhance the experience of viewers. Steps in this direction are already being taken by series such as Game of Thrones or Doctor Who. There are already cinemas initiating such this strategy in their regular programming. An example is the Alamo Drafthouse in Austin, which screened episodes of Breaking Bad throughout the series finale. The likelihood that audiences will head to theaters to watch series is enhanced for programmes that can create a solid follower base. Film franchises still benefit from a certain fan culture, but audiences are seeking original content and TV has steadily developed for that. This position will only strengthen as OTT services can prove a solid audience, eventually leading to TV shows equalling or surpassing films in production budgets. Creating event screenings around TV shows will offer a potential opportunity to involved advertisers. Currently that is becoming more and more of a pain point, in the context of TV shows increasingly being watched through non-linear services. With streaming increasingly becoming the prefered method of accessing content, we are likely to see further development in ‘home cinema’ technology. While opinions among filmmakers are split on the proliferation of streaming services, the growing popularity and geographical expansions of services such as Netflix or Apple TV shows a clear preference of the audience, as it allows for them to adapt the experience to their needs and create their own habits. 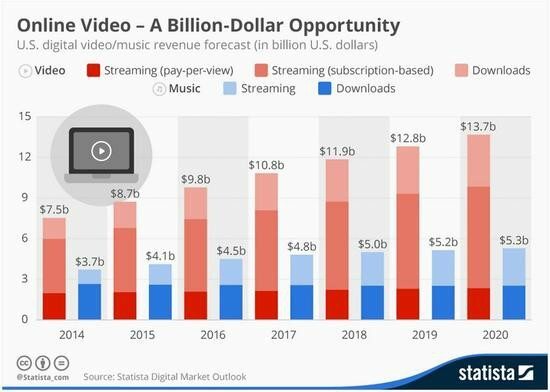 When it comes to new content, through streaming the creators have the opportunity to bypass traditional distribution patterns and virtually eliminate release windows. This will benefit both the creators and the audience, at the expense of current gatekeepers: distributors and exhibitors. Jeffrey Katzenberg predicts in the near future release windows could be shortened to 3 weeks (it might go even further than that- since we are already witnessing day-and-date VoD releases), followed by a ‘pay per inch system’. What he is suggesting is that the industry will evolve towards variable pricing based on the size of the screen the content is viewed on. Some argue that this is a losing strategy, particularly because Netflix and similar services already have too strong of a standing in the market. This is based on the assumption that Netflix will not change its business model. 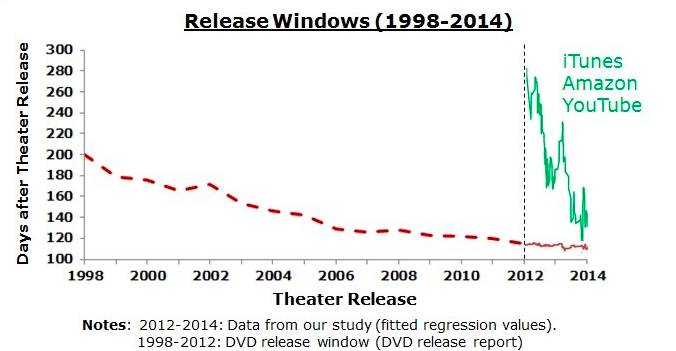 Expect release windows to continue shortening, while Ultra-VoD releases increase their incidence. As we discussed in our previous article, there is a lot of experimentation already occurring on the distribution side of the industry. The democratisation brought about by the Internet will continue to offer producers the possibility to hack the distribution model and take efforts into their own hands, when it comes to both theatrical and online distribution. While traditional distributors will be affected by this change of the model, it is also an opportunity for new ventures to thrive offering their services in order to bring guaranteed audiences and viewing locations. These companies will have to offer flexibility in catering to the individual needs of each of the films and leveraging on social media to identify, reach, and engage target audiences. They will also have to be open to exploring distribution channels outside of the movie industry itself. Instead of focusing on obtaining the largest possible revenue in the opening weekend, these companies are likely to follow a film’s journey for a longer period of time, relying on putting the film in the right context and engaging the relevant opinion leaders. This has been successfully achieved by Mel Gibson who self-distributed The Passion of Christ back in 2003. The film’s theatrical run was actively supported and promoted by a number of religious groups which continue to show the film during events for their congregations, such as ‘church movie nights’. Expect to see Producers taking a bigger role in marketing and distributing their own movies and content. 6. 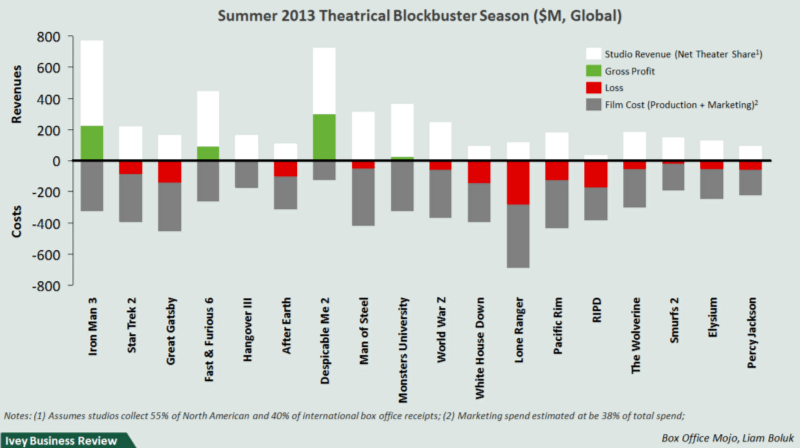 Traditional blockbuster distribution will continue its status quo, with both major successes and major flops. As outlined in the first article of this series, the current distribution model has been developed to the benefit of blockbusters, and it is likely that it will continue to work in the near future, especially when combined with greater emphasis on viewing experience. But given the amount of alternatives out there, it’s likely that a number of these big budget productions will still flop at the box office if they don’t deliver what audiences expect. The summer of 2013 is a good reminder of that; Disney’s Lone Ranger flopped in spite of Johnny Depp’s star power; Sony had not one, but two box office bombs- White House Down and After Earth. This is only likely to be furthered by the social media acting like a double-edged sword- viewers can make or break a film. Expect studios to continue to invest in Franchises and marketing to the international markets. The offer of content specifically produced for the web has expanded dramatically in recent years. An increased audience for short formats will also give rise to more companies like Maker Studios (now a part of Disney). Holding its position as the largest independent Youtube network (since 2012), its channels have over 650 million subscribers and it attracts a self- reported 10 billion monthly views. Similar ventures are likely to prosper and be sought as additions by the studios, both for their potential to generate interest and for their role in discovering new talent. Expect studios to invest heavily in these new formats and producers, as well as in the new Franchise opportunities these will inspire. Actors’ salaries represent a sizeable portion a film’s budget. It is an investment not only in the performer’s talent, but also in their star power, which can play a very important role in selling a film. Between reality shows and Youtube, new talent is discovered every day and it comes with a pre-existing fan base that becomes a potential audience for the projects they are involved in, whether they are connected to cinema or TV or any other medium. And while fame becomes shorter lived and star power becomes increasingly diluted, the upside for the industry is that increased competition is likely to decrease salaries for talent but provide more pathways for endorsements and product placements. A recent example of a success kindled by Youtube fame is the German production Potato Salad, produced, directed by and starring youtubers, particularly popular with young audiences in Germany. They ensured the film’s commercial appeal, despite its quality. Potato Salad is currently the movie with the lowest rating on IMDB, yet on its opening weekend it was the 7th highest grossing film (competing with the likes of Minions, Magic Mike XXL and Ant Man). While domestic box office revenues are soaring, the studios will continue their exploration of emerging markets. China is already a priority target and the efforts to engage the audience there will only increase. Focusing on international markets will have an impact on the genre of future productions, as well as on the casting. On the one hand, studios will seek to produce films with themes that have the widest possible appeal, while on the other they will open up more to involving local co-producers and creating more culturally specific products. This could help develop other production centers, in addition to Hollywood, creating the conditions for the production of new original content. This is potentially interesting to film producers and advertisers who will have to change their strategy to cope with the new viewing habits. As a result, product placement opportunities will become the core focus, which also means that advertisers will become more involved in the production process, both conceptually and financially. Financing films through crowd funding is also going to continue to rise. Campaigns are already being mounted not only for producing the films, but to support the post-production or distribution. 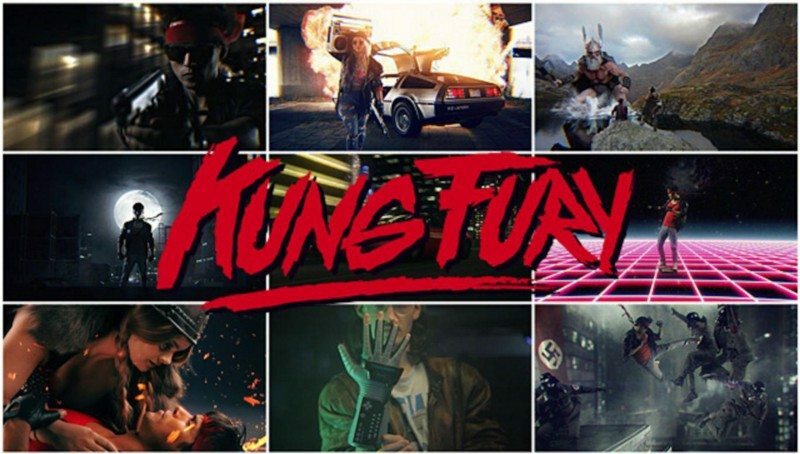 Kung Fury is a recent example of the former- with the team even trying to build towards transforming their 80s style kung fu-cop extravaganza into a feature film. While they did not reach as far, supporting their crowd funding campaign with a diversified online presence (including a website and 9Gag) helped create a fan base and get the film broadcast on TV. Another development to be expected in terms of financing is the rise of platforms such as Netflix and Hulu, as well as HBO, to the point of these companies acquiring studios in the future. At the moment, they have developed a business model that has surpassed and challenged that of movie studios. They are already more connected to audiences in the type of content that they deliver, and in the way that they are delivering it. They are attracting talented creators with the freedom of producing original content. Netflix is already investing in creating content for the cinema, while continuing their streak of successful original series. Other platforms are open to exploring with distribution. After earlier this year picking up art-house hit Arabian Nights for theatrical distribution in UK and Ireland, MUBI will premiere Paul Thomas Anderson’s upcoming documentary. The measures planned are destined for e-commerce at large and are part of the Digital Single Market strategy. In terms of the audiovisual industry, they clearly put a strong emphasis on on-demand services. As part of the goals, the initiative aims to increase the promotion and circulation of European audiovisual content. But a democratisation of access to European content will imply the same for all content, and current players in the film industry are opposing the adoption of the Digital Single Market on the grounds that it would open the gates for giants such as Netflix, Amazon and Google, which would defeat the very purpose of the measure. The disruption will be experienced across the industry, affecting distribution and sales (by virtually collapsing release windows) as well as production (by affecting co-productions, which account for a quarter of European films). The adoption of the measures is likely to decrease the number of European productions (which can also result in a decrease in government spending) and to have smaller players eliminated or re-purposing their activity. With the measures now under public debate and scrutiny, the timeline for their implementation remains uncertain. The panel is still out whether the stakeholders will be able to persuade European institutions to give up implementing the strategy for the audiovisual sector. Alternatively, the debates could lead to adapting the measures in a way that better protects European audiovisual production from foreign competition. Based on current trends, the next 10 years will bring about a democratisation of film and TV through technology. As usual, these changes will benefit some to the detriment of others. The consumers will gain in terms of viewing habits and customised experiences. They will also benefit from the growing power of content owners will have to create and distribute (look no further than Amazon letting viewers choose which show they want made). Current gatekeepers, especially in the distribution and exhibition chains, will be faced with numerous challenges. Their survival in the new context will rely on their ability to get creative and invest more in understanding their audiences. Gruvi’s platform provides entertainment brands with powerful tools and tracking that streamline audiences through to watching content & buying tickets on social media at conversion rates far higher than traditional display advertising. Gruvi’s client base includes HBO, Sony, Disney as well as many independent distribution companies globally. About the author: Ben Johnson – I run a company called Gruvi: we help entertainment brands reach and build audiences for their content through technology and intelligent media buying.